My wing arrived yesterday from Oregon, only a couple days behind me - thanks to Paul for taking care of that! 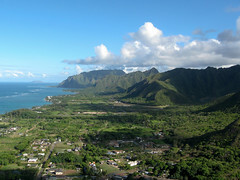 Ray picked it up from Dorothy's office yesterday and brought it out to Kahana, where we flew with Jim, Jeff and Wayne. Conditions were light, and it took us awhile to get high, but I finally connected with a thermal over Puu Piei, taking me to 2300 feet. I headed out front and then burned over to Punaluu. I arrived at the front of the Punaluu ridge with about 1300 feet, and I had to scratch in zeros for quite a while, until I managed to hook one suprisingly strong thermal that took me up almost a thousand feet. I figured I could duck back toward Sacred Falls, but I was surprised to find nothing but sink as I headed back, so I turned around and jumped to the next ridge, behind my house, where again I scratched in zeros a while. I never managed to connect with anything organized, so after a while I headed out over the water to do some wingovers before landing at Hauula Beach Park. Thanks to Jeff for the quick retrieve! What a great day to get back into the air. I know many pilots like to explore the upper limit of wind strength in our windy part of the world - I've explored it myself on occasion. But my preference is to push the lower limits, even though we don't get as many opportunities for it. Flying thermals at our ridge sites is a rare treat. Today was one of the lightest days on which I've managed to get up and hop a few ridges down the coast, and I'm looking forward to more days like that. After I landed, a couple came up and asked me, "Did you do that on purpose?" which has got to be one of the better questions we get asked. I said I wouldn't have minded getting to the next beer store, since it happens to carry my all-time favorite brew, but the 7-11 here would do just fine. It's great to be back!